Worried About Your Chimneys? ALS Can Help! Most properties have a chimney that is an essential part of the building. We tend to take them for granted, yet they need regular maintenance, much like any other part of the building’s structure. The stack is the main exterior section visible from the roofline and the stack usually has a chimney pot at the top. The chimney breast is inside the property and forms the interior section or sections below the roof. Stacks are usually the highest point of a building and are exposed to the elements. If not cared for, and in harsh weather conditions, the stack can deteriorate; cracks appear, water enters, causing damage. 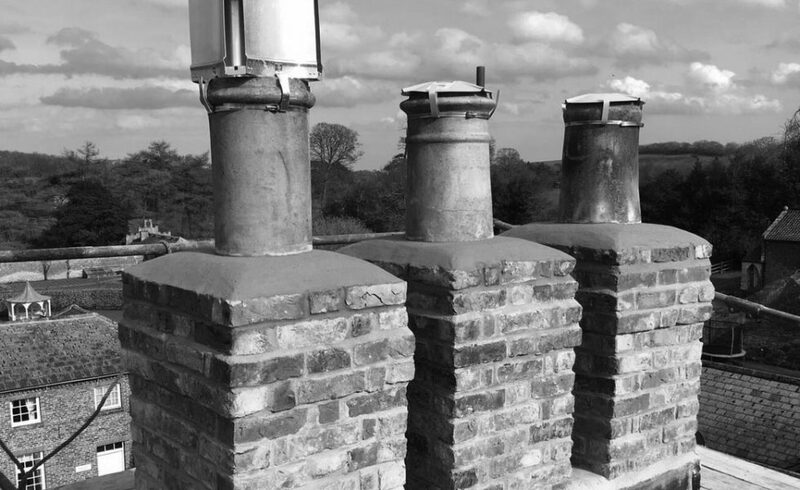 Chimney pots also come in many shapes, sizes and styles and will also need checking periodically. This term might be unfamiliar to homeowners, however this part of the chimney structure is the bed of mortar, usually on a slope or pitch that holds the chimney pot in place on top of the stack. The flaunch has another role; helping water run away from the stack. However like any other part of the roof or chimney, this area receives wear and tear, and if badly damaged, usually needs replacing completely. This can be done with a mixture of grit and cement or with a lime-based mortar. The chimney pots are removed while the flaunch is replaced, and then pots are re-seated back in place. The external parts of mortar joints, usually in brickwork and other masonry, deteriorate over time. Eventually, gaps or small voids appear, meaning water can enter at various points. Once this happens, any surrounding brickwork can erode. The best way to deal with this is to have the existing pointing work thoroughly racked out, removing the old materials, followed by a complete replacement of the materials, so the new pointing can withstand the elements and do its job. This is the section leading away from the base of the chimney stack that in turn leads away as much moisture and debris from the stack as possible. While lead trays look neat and tidy, they do bear the brunt of the weather and will need looking at from time to time. This is an option particularly for older properties where it might be difficult to maintain or replace any damaged chimney structures. We can treat the stack with a silicon water repellent, which is not a permanent solution but can last for a few years. Here at ALS we are experts in traditional hot-mix lime pointing methods. This type of mix is appropriate for use on older properties or with Listed Buildings. For these types of buildings, using the correct mortars helps protect them for the future. Here at ALS, because of our knowledge and expertise with this line of work, we have developed our own specialist chimney scaffolds. This means we can offer a full and efficient service for chimney maintenance while also reducing the need for regular scaffolding. We are happy to attend your property and carry out a survey of your chimney area.